Posted April 25th, 2016 by Mike Boyes & filed under Abnormal Psychology, Death and Dying, Development of the Self, Stress Coping - Health. Description: In the past I blogged about articles discussing recent films that contain direct psychological content or themes that are relevant to psychology. In the article linked below there are brief discussions written by a number different people about not so recent films, but films nonetheless that have some fascinating psychological questions within them. Consideration of the sorts of films reminds us of the ongoing links between psychology and philosophy at least in the sense that studying psychology in many areas involves the study of some of the basic questions of what it means to be human and what it means to have a human experience. You may have seen one or two of these films already. If so shall your recollection of the film fits with the descriptions below and if not, maybe that descriptions help you decide whether you want see the films. Each of them provides us with some fairly deep things to think about. Source: Psycho thrillers: five movies that teach us how the mind works, Catherine Shoard, Philippa Perry, Stephen Pinker, Dasher Keltner, Sue Blackmore and Susan Greenfield, movies, The Guardian. Not all films have clear psychological themes within them, although maybe that’s not true. To a certain extent all films involve some sort of storytelling which in turn involves some sort of assumptions about the nature of the human experience or at least some sort of questions about the nature of the human experience. I’m not suggesting that every film has to be analyzed down to its tiniest psychological subcomponents, however, particularly when you find film is making you think or examine feelings the perhaps came up unexpectedly, evoked by something presented in the film it’s worth reflecting on what they might be telling us about the nature of human experience and about the nature of human psychology. Sigmund Freud’s psychoanalytic theory for example while mainly discussed within psychology as a historically important but not currently relevant theory is still very popular within literary and film criticism as a storehouse of concepts themes and ideas for understanding and analyzing human experience, human tension, and human relationships. Freud’s account of the traditional family model provides an interesting explanation for why it is that film so often focus on issues of parent-child relationships. If this were not so why would it seem to matter so much that Darth Vader was Luke Skywalker’s father? The bottom line is that when films make you think you should turn on your psychology radar use it to help you figure out what it is the film has caused you to think about and why it might feel like a particularly poignant issue that it seemed to be in the film. If you’ve seen any of the films discussed in the linked article above when you think of the points raised in the discussion of that film? Did the points make sense to you? Why or why not? What is it about the presentation of characters and/or relationships and/or human situations in films by actors, writers and directors that is so amenable to psychological reflection? What other films if you seen lately that got you thinking in ways that drew you towards applying what you’ve been learning in psychology in an effort to understand the feelings and thoughts that the film gave rise to? Fleming, M. Z., Piedmont, R. L., & Hiam, C. M. (1990). Images of madness: Feature films in teaching psychology. Teaching of psychology, 17(3), 185-187. Germeys, F., & d’Ydewalle, G. (2007). 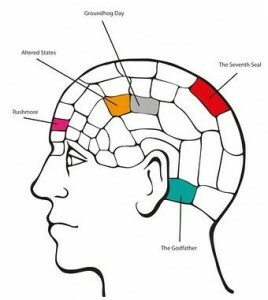 The psychology of film: Perceiving beyond the cut. Psychological research, 71(4), 458-466. Green, R. J. (2004). Teaching psychology through film, video. APS Observer: Teaching Tips. Conner, D. B. (1996). From Monty Python to Total Recall: A feature film activity for the cognitive psychology course. Teaching of Psychology, 23(1), 33-35.